The Dow Jones industrial average fell more than 300 points on Thursday, erasing its gains for the year. The S&P 500 fell 2.7% last week, the biggest weekly decline since Jan. 2012. Now, investors are trying to determine if the sell-off was overdone, or just the beginning of a larger downturn. It's been more than two years since the S&P 500 had a correction, typically defined as a drop of 10% or more from the most recent high. Despite last week's plunge, the S&P 500 is just 3.1% below its all-time high from last month. With stocks still relatively expensive, many investors have been waiting for a pullback to buy shares at more attractive levels. Related: Small stocks sink -- bad sign for economy? 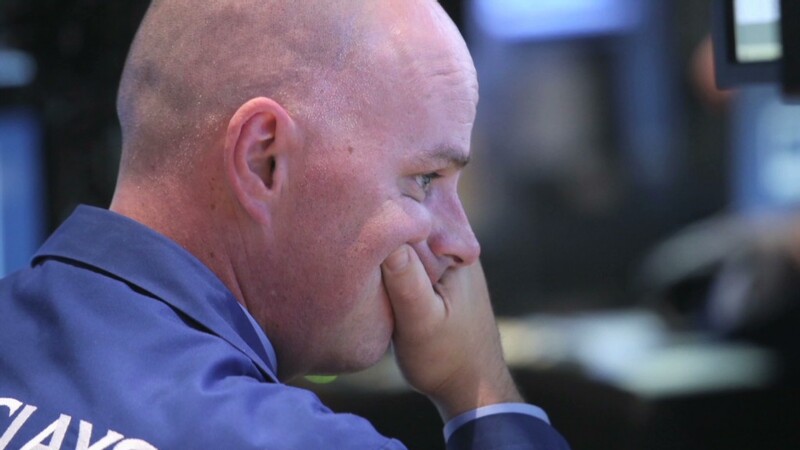 Nick Colas, chief market strategist at ConvergEx Group, a global brokerage in New York, says "there is no way to know right now if this is the beginning of a larger sell-off" or just a temporary blip. The VIX (VIX), a gauge of market volatility, jumped more than 30% last week. CNNMoney's Fear & Greed Index, which includes the VIX and six other gauges of sentiment, is at a level indicating "Extreme Fear." Investors certainly have a plenty to worry about. The conflict in Gaza is unsettling and the showdown between Russia and the West over Ukraine is intensifying. Argentina is another hot spot, though investors seem confident that last week's default won't cause major problems in other emerging markets. In addition to geopolitical turmoil, investors are debating how the Federal Reserve may respond to the recent spate of strong economic data. U.S. gross domestic product, the broadest measure of economic output, increased 4% in the second quarter, bouncing back form a winter swoon in the first quarter. The job market continued to improve in July, though the pace of hiring slowed a bit from June. The Fed is gradually winding down its stimulative policies, and investors have recently become obsessed with trying to gauge when the central bank will eventually hike interest rates. Most economists expect a rate hike will occur in the spring or summer of 2015. "There is a lot of fear that the Fed's policies and world events will lead to a market crash in the near future," said Keith Springer, president of Springer Financial Advisors in Sacramento, Calif. While he expects the Fed to remain on hold, Springer said stocks appear headed for a decline of between 7% and 10%. "For the next few weeks, hunker down," he said. A big week for media companies: The media sector will be in focus with quarterly reports due from some of the biggest names in the entertainment industry. Both Time Warner (TWX) and 21st Century Fox (FOX) will report results next week. Time Warner, the parent company of CNNMoney, rejected an $80 billion buyout offer from Fox, the movie and television company run by Rupert Murdoch, in June. But it is widely believed that Fox will eventually make another bid. Investors are eager to hear what executives of both companies say about the possibility of a merger when they take questions from analysts after their earnings reports. Murdoch's other company, News Corp. (NWS), which owns the Wall Street Journal and other newspapers, will also report results next week. Disney (DIS), which is releasing "Guardians of the Galaxy" this weekend, will report results on Tuesday. It's been a sluggish summer at the box office this year, and investors are hoping that Disney's latest film may get people back in theaters. Viacom (VIA) and CBS (CBS) are also set to release earnings this week.